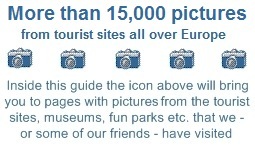 European Tourist Guide have found a lot of interesting museums and tourist sights that focus on World War II in Europe. At these museums and sights you will find German bunkers, weapons, uniforms, KZ camps, war graves and memorials and a lot of historic places. As there are so many interesting museums and sights related to the D-day landing in Normandy, this historic event has it own page with links. - World War II - "Push towards the Rhine"
- a part of F.W.A. Bunker Museum "Stichting Bunkerbehoud" - "Atlantic Wall"
Museum Tweede Wereldoorlog "Zeeland 1939-1945"
- about the Atlantic wall & Battleship "Tirpitz"